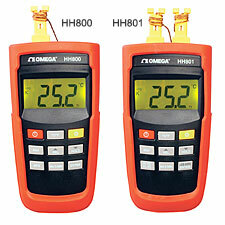 The HH800A and HH801A digital thermometers are easy to use hand-held indicators for type K or J thermocouples. Both feature a large 3 1/2 digit LCD with a maximum reading of 1999. The HH800A is a single-input model while the HH801A has two inputs and allows for display of T1, T2 or .T (T1-T2). Both models feature a thermocouple offset adjustment and are switchable between Celsius or Fahrenheit. They also have a data storage capability for up to 125 manually stored measurement samples. The HH801B offers most of the features of the HH801A except data storage, but also accepts four different thermocouple types and features settable Hi/Lo limits for both inputs, with an integral alarm beeper. The HH801B also features three displays for simultaneous viewing of both inputs and the differential. 1 degree or 0.1 degree from -59.9 to 199.9 degree °C or °F (auto ranging). Accuracy @ 23°C ±5°C, for 1 year, not including thermocouple error. Accuracy: Accuracy @ 23°C ±5°C, for 1 year, not including thermocouple error. 0.1 times the applicable accuracy specification per °C from 0°C to 18°C and 28°C to 50°C. Reading Rate: 1 time per second. Battery: 1.5V x 4pcs AAA size. Auto Power Off: Approximately 20 minutes. Nota: Comes with 4 “AAA” batteries, Type K thermocouple (one per channel), rubber boot and complete operator’s manual.